Side zip style for electric and non-electric fencing, all weapons. Made from materials normally associated with much higher priced equipment. Impressive high quality tailoring and finish throughout. We have designed this range for those who prefer the ease of use that side zip jackets provide even for communal club use. Ideal for club, school, universities etc as well as those starting to buy their own equipment or replacing older kit and prefer the convenience and appearance this well tailored style offers. 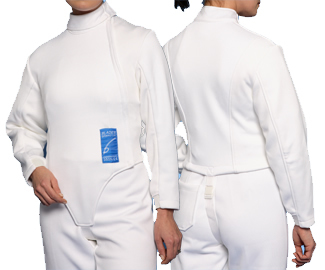 A must for any competitive fencer who only needs Level 1 standard. Meets or exceeds BFA competition requirements. Additional features include: Blade trap on collar, Elasticated cuffs, Strong adjustable under strap. Outstanding value.